The German Research Center for Artificial Intelligence (DFKI) was founded in 1988 as a non-profit public-private partnership. It has research facilities in Kaiserslautern, Saarbrücken and Bremen, a project office in Berlin, a Laboratory in Niedersachsen and a branch office in St. Wendel. In the field of innovative commercial software technology using Artificial Intelligence, DFKI is the leading research center in Germany. Based on application oriented basic research, DFKI develops product functions, prototypes and patentable solutions in the field of information and communication technology. Research and development projects are conducted in nineteen research departments and research groups, eight competence centers and eight living labs. Funding is received from government agencies like the European Union, the Federal Ministry of Education and Research (BMBF), the Federal Ministry for Economic Affairs and Energy (BMWi), the German Federal States and the German Research Foundation (DFG), as well as from cooperation with industrial partners. Twice a year, a committee of internationally renowned experts (Scientific Advisory Board) audits the progress and results of state-funded projects. In addition, BMBF evaluates DFKI regularly. The most recent assessment was again very successfully concluded in 2016. 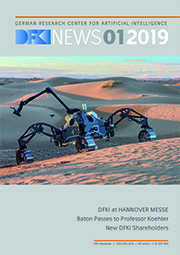 DFKI is actively involved in numerous organizations representing and continuously advancing Germany as an excellent location for cutting-edge research and technology. Far beyond the country’s borders DFKI enjoys an excellent reputation for its academic training of young scientists. At present, approx. 570 highly qualified researchers, administrators and more than 450 graduate students from more than 65 countries are contributing to approx. 250 DFKI research projects. DFKI serves as a stepping stone to leading positions in industry and successful careers as founders of spin-off companies. Over the years, more than 140 staff members have been appointed professors at universities in Germany and abroad.